I, gypsy. The voyages of Jan Yoors. Starting from the 25th of September 2015, the Red Star Line Museum will be holding a photo exhibition in The Shed with a selection of photos and films of the versatile Antwerp-New York artist Jan Yoors. 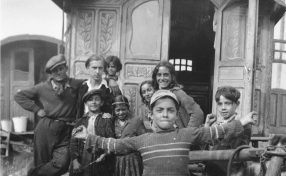 For this exhibition, photographer Koen Broos selected photos of Yoor’s travels with the Roma gypsies in the 1930s, of ethnic communities in New York in the 1950s and photos of his trips back to Belgium to (re)visit the gypsies.